Can Native Zooplankton Control Mosquitoes? What mosquitoes are found in Talbot and Dorchester counties? What species of native copepods eat larval mosquitoes? Can we these native copepods effectively control mosquitoes? We will focus on container breeding mosquitos that are found in places where standing water exists and for which we have already developed methods for their capture. In some places, more ecologically safe and conservation-oriented control agents are employed, in which fish and birds eat larval and adult stages of the mosquito. The efficacy of these strategies is still under scrutiny, but two other states have been working on using crustacean zooplankton called copepods because some copepod species are known to eat larval mosquitos. 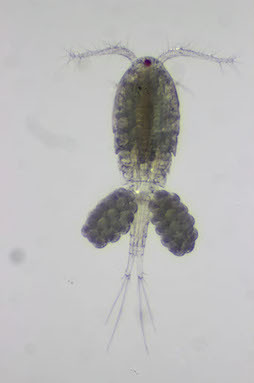 Copepods are a diverse group of animals that are found in nearly all bodies of water, from the deep ocean to high alpine lakes, and they may be the most abundant group of animals on earth. 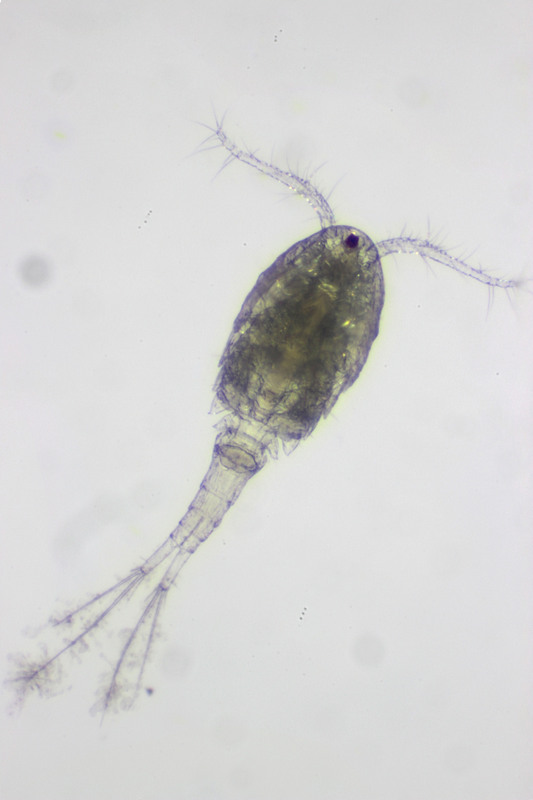 The images below are of a male and female Acanthocyclops robustus, a species of freshwater copepod that was isolated from ponds in Talbot County, MD, and that we now have in culture at HPL. Preliminary experiments showed that these copepods will eat mosquito larvae, but that they are somewhat picky eaters, prefering some species of larve over others. Stay tuned for more in this space! Acanthocyclops robustus female (left) and male (right). Photo credit: Catherine Fitzgerald. Click on image for full size. Support for the pilot project provided by the Waterfowl Chesapeake Communities in Conservation funding program.